Nutty salted dark chocolate fudge! I know, this is not a tempered chocolate recipe. 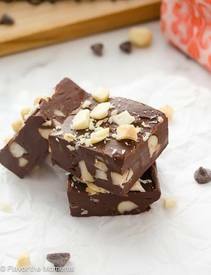 But, today is National Nutty Fudge Day, so I am making an exception. Besides, um...chocolate?! This fudge is the epitome of chocolate covered macadamia nuts but better…so much better. Dark chocolate! Loads of macadamia nuts! And it’s salted!